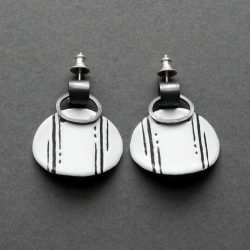 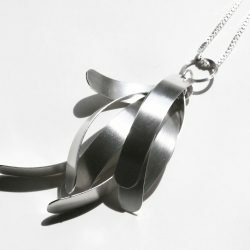 Mizuki is an award winning contemprary jewellery artist, living and working in Worcestershire having graduated from Hereford College of Arts. 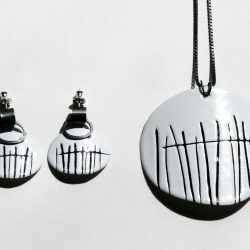 Practicing in mark-making and playing with paper, gives Mizuki simple yet delicate design ideas in her jewellery making. 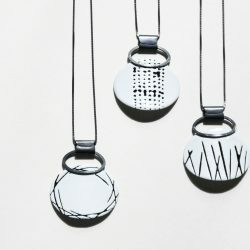 Enamelling is Mizuki’s most recent fascination in her practice, she creates unique mark-making patterns on delicate enamelled copper surfaces. 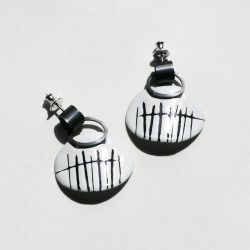 Oxidised black silver fastenings for each enamelled elements are carefully designed and handmade by Mizuki, the black lines cast like shadow lines parallel with the scratched enamel marks.